A look at the aerodynamics and convenience of a water bottle between the arms for time trials. 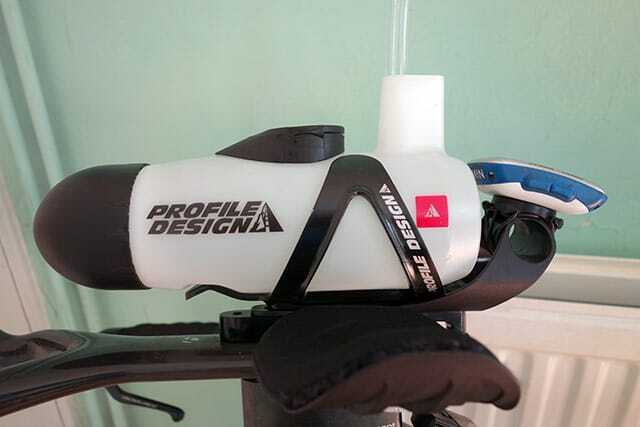 12 months ago – three days before the ECCA 100, I did a post on rear mounted bottle cages. The post wasn’t much use for me because – 5 miles into race, the said waterbottle self-ejected itself onto the road, never to be seen again. I somehow managed to do the 100 mile TT on 1.5 litres, but it was close to being a disaster. 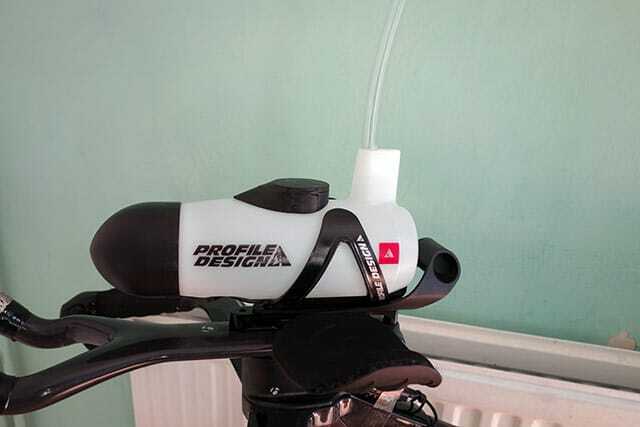 This year I’ve gone for the other end of the bike and spent considerable time looking for a waterbottle which could be mounted on the aerobars. The advantage is that I’ve heard this is a very aerodynamic position for a waterbottle. I know Matt Bottrill uses something here for CTT events. But, for some reason I bought the profile design Aero HC. 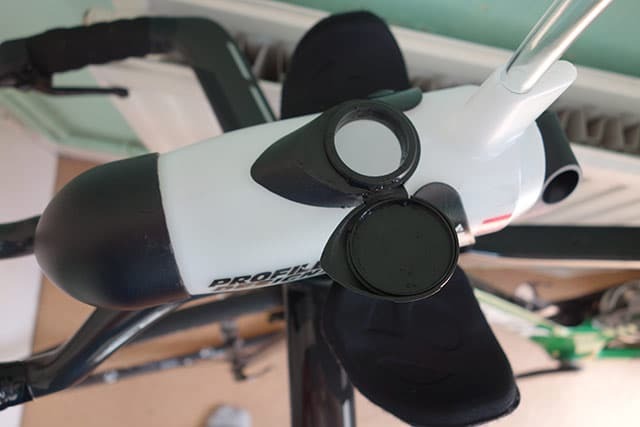 This can be fitted to any aerobars – whether a Speed Concept or not. However, I can ditch this thing and just use with Bontrager bolt cage. It looks quite aerodynamic. It reminds me of the Japanese bullet train. When you ride it your arms fit snuggle around the waterbottle – creating a nice smooth air flow. Everything is well designed for aerodynamics and without the flapping bits of velcro, it is quite smooth. The plastic tubing coming out of bottle is in the way, but on the positive side you can drink whilst in aero position. Usually when drinking you have to sit up – it can feel like opening a parachute. It’s quite easy to fill, you can pour liquid in top. The black cap also comes off to empty and wash bottle. It is OK, to drink from. Though you want to make sure the straw is right to bottom, otherwise you won’t be able to get it all out. The plastic tubing is too long, when you first buy it, but don’t cut too much off or it will be hard to drink from. A scuffed Profile Design with pastic tie. The first problem is that on its first test run, it ejected itself within the first two miles. It was a little rough surface, but I wasn’t going fast. This is a disaster and the problem with water bottles in non-conventional places of bikes. I did rest of ride in tribars and that kind of holds it in place. When there is less liquid it is also less likely to eject. Still you need to be 100% certain it will stay in place – you can’t rely on being on tribars and roads to be super-smooth. I just used an additional plastic tie, which keeps it in place, but at small aerodynamic cost. A shame because it spoils the looks and CdA. You can fit a computer behind the waterbottle. This is an aeroplace, but you can’t read it whilst riding a TT so a waste of time, I took off, and put computer elsewhere. It was hard to find many options for a aerobar mounted water bottle.. This is quite good, but could be a lot better. 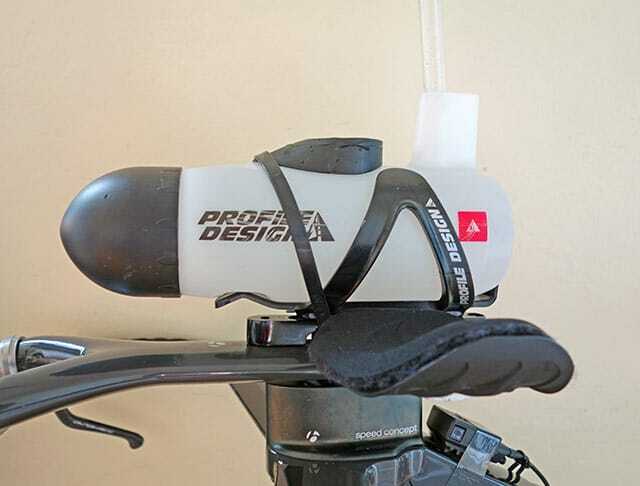 You shouldn’t need to use a plastic tie to secure in bottle cage. I don’t like plastic tubing just sticking up in the air, it would be best to be able to have horizontal and then lift up when you need to drink. The computer mount is in a place where you can’t see it. For those without Speed Concept, the attachment system is quite clunky for a specifically aero piece of equipment. Still would be interested in a better product. I too had a lot of interest in this, Cervelo did a lot of testing to find the best place for bottles and BTA is apparently the best solution. The xlab 400 seems to be the best for aero, but the mount isn’t very good IMO. The ZIpp BTA mount is very good, good Garmin mount that you can read, but isn’t compatible with the Xlab bottle. However there is a company in the US that makes and extension bracket that solves the problem. I’ve ordered one, but went for the cheaper postage $117 for a $30 part seemed excessive, so a 4-5 week delivery. It posted this Monday so will be interesting to see how long it really takes. Hope that helps a little. 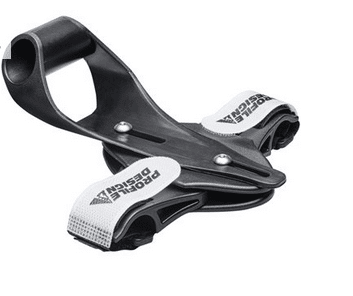 I think the problem with ejecting is that there is no shock absorption on the Trek Monobar extension thingy. I’ve had the same problem of ejecting with my Xlab 400 bottle on my 2015 SC. Never had a problem on the 2013 SC. Put a piece of 3M sticky Velcro on the bottle and the other half on the cage. Problem solved.